The shootings of two men in Londonderry were an attempt to "control communities through fear and violence", the PSNI has said. 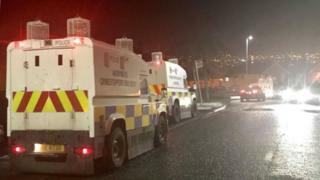 The men were shot in separate incidents in the Ballymagroarty area of Londonderry on Friday evening. The shootings happened within 10 minutes of each other and less than 100 metres apart. In the first attack, a 24-year-old man was shot in the knee on a grassed area close to Corrib Court. The incident was reported to police at about 20.10 GMT. The second shooting was reported just after 20.20 GMT. A 32-year-old man was shot once in the leg on a grassed area near O'Casey Court. "We are treating both incidents as paramilitary-style attacks; attacks that were brutal and vicious and will leave these two men with both physical and psychological scars," Det Sgt Michelle Boyd said. "These attacks are yet again more examples of how criminal groups seek to control communities through fear and violence." The Western Trust said both men were in a stable condition at Altnagelvin hospital in the city. Sinn Féin councillor Eric McGinley condemned the incident. "There can be no place for the use of guns or gangs of masked men on the streets of our city," he said. "All of this is in stark contrast to the good work that is going on in this community."